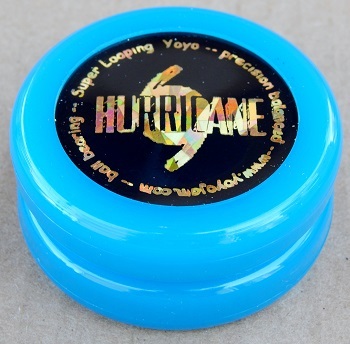 Hurricane super looping yo-yo was available only in an ice blue color with multicolored holographic Hurricane insignia. Specially designed for looping, this ball bearing yo features a narrow adjustable string gap and flat inner walls for exceptional looping capability. Original retail price: $13 US. YoYoJam closed its doors and went out of business Wednesday, December 30, 2015.